A discussion on the baddest supervillains and nemeses from comics of them all. Lex Luthor or Kingpin? The top 5 may surprise some readers. Disagree with the choices? Feel free to send in your own selection. This DC creation is a cyborg adept at almost unlimited replication of the special powers of other superheroes and villains. Being a traditional supervillain isn’t enough for Amazo, who continually evolves after learning new powers and is on a philosophical quest to discover the meaning to existence. In his first appearance (The Brave and the Bold #30, 1960) he replicates the super powers of the classic Justice League of America. An episode line introduced later saw Lex Luther enlisting the services of Amazo. 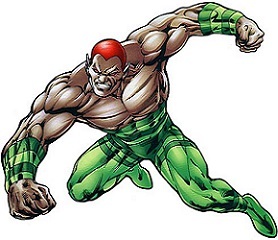 He was subsequently reactivated many times to emerge as a primary nemesis for other DC superheroes, including Superman, Aquaman, Green Lantern and the Guardians of the Universe. Each incarnation manifests a different array of super powers meaning that Amazo incrementally grows ever more powerful. In the DC Animated Universe series “Justice League” and “Justice League Unlimited” after forming an awareness that he had learned everything possible on Earth Amazo eventually left to discover more about his existence and own origins. Amazo later, of course, returned to again battle the Guardians of the Universe and the Justice League. Jean Grey is an Omega level mutant, reputedly the most powerful mutant in the entire X-Men world. Not just equipped with telepathic and telekinetic powers that rival Professor Xavier, this red haired Marvel superhero/ supervillain, is capable of firing psionic firebirds and electromagnetic pulses. Jean Grey’s true power level was initially suppressed to protect her during childhood by Xavier. 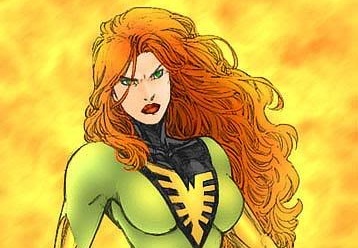 While on a mission to rescue the earth Jean Grey is exposed to the lethal radiation of a solar flare. An unexpected sequence of events is then triggered where the full extent of her mutant telepathic powers become accessible. Jean Grey is reborn as the much more powerful Dark Phoenix. Coming to terms with this immense new powers proves initially impossible and a trajectory into darkness and insanity follows. Now becoming an adversary of the X-Men, in movie X-Men: Last Stand Jean Grey accomplished the unthinkable and killed Professor Xavier. In the guise of Dark Phoenix she is capable of flying throughout the universe, moving faster than the speed of light, and even destroying entire planets. Jackie Estacado, also known as “The Darkness”, was inducted into a mafia crime family as a teenager and performed nefarious exploits in the criminal underworld. He later discovered that he was selected by destiny to be inhabited by “The Darkness”, an ageless supernatural force that predates modern human civilisation. In becoming the latest host for this primordial power he began harnessing limitless power and quickly made full use his abilities in gaining control of organised crime and cementing his position as a crime boss. 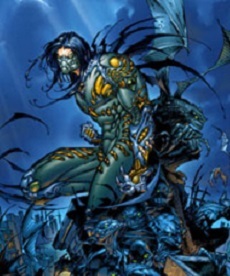 In the comics Jackie Estacado/ The Darkness is frequently depicted in storylines controlling demonic forces and battling other elemental spirits. A morally ambiguous character the darkness also insists on living by a strict code of ethics, often putting aside personal differences in gaining revenge on those harming people close to him. Not only is the darkness imbued with super strength rivalling any of the more famous superhero comic characters, he can shape-shift at will reforming his body into many different manifestations when necessary. A Top Cow Productions character, he was created by Marc Silvestri, Garth Ennis and David Wohl. Bane first appeared in Vengeance of Bane #1 (January 1993). A difficult childhood indeed, born into the prison of Peña Duro situated on a fictional Caribbean island. His childhood and early adult life were spent honing his physical and mental skills defending himself from the dangerous prison inmates. The penal authorities undertaking secret experiments forced him to become a test subject for the drug Venom, which magnified his already prenatural attributes. 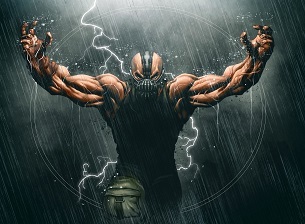 Bane, while in prison, is tortured by visions of a terrifying bat creature that appears in his dreams. His ambition after swiftly escaping from the prison experiments turned to destroying Batman who he believes must be the source of his visions. The dastardly campaign of schemes encompasses releasing the deranged prisoners of Arkham, teaming up with Ra’s al Ghul and destroying Gotham City using a nuclear reactor. His strength and intelligence, a rare combination gives him more strategies to contend with Batman, and he is apparently capable of the rare accomplishment of deducing Batman’s alter ego. He is also connected with legions of supervillains in the Suicide Squad, Secret Society of Super Villains and Secret Six. 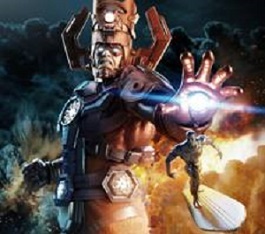 Galactus is a billion years old supervillain, reportedly by all accounts the oldest being in existence, so ancient in fact that he originated in a universe that pre-existing the big bang. Ranking as uncontestably one of the most powerful beings in comic books. He first appeared in Marvel Comics in a 3 episode series in the 1960s (Fantastic Four #48-50) as a nemesis of the Fantastic Four. Galactus was mistakenly awoken from one of the longest slumbers in history following the creation of the universe by a “Watcher”. He wasted no time in swallowing entire planets, becoming known as the destroyer of worlds. His presence on worlds awaiting destruction was heralded by the Silver Surfer in exchange for sparing his home world of Zenna-La, until after feeling sympathy with the humans the Silver Surfer rebelled against him. The Fantastic Four in cahoots with the Silver Surfer manage to defeat Galactus in this first encounter, but he returns to battle the Fantastic Four many times. Galactus even crosses over into the DC universe, in the Infinite Destruction, Superman temporarily becomes the central nemesis locking horns.